"The Malice Intended." It didn't surprise me that quite a few journos and bloggers are not just not sad but welcome the arrest of the Ho Kay Tat and Co. "They've been asking for it," said quite a seasoned reporter with a news portal. "The way I see it the news was deliberate and not an error, it was reported with Malice Intended. How can any new media or portals write stories without checking and with concrete back-up to back their stories." "Would you like a photograph with me before I go in?". He was referring, of course, to my previous day's blog posting All's not well at Angkasapuri (March 26) in which I slammed the authorities for not taking serious note at TMI for an article that could cause friction between its readers and the Monarchy, an important institution in this country. My reaction to Jahabar's suggestion was sure. "Ah, you won't go in lah." I was wrong! 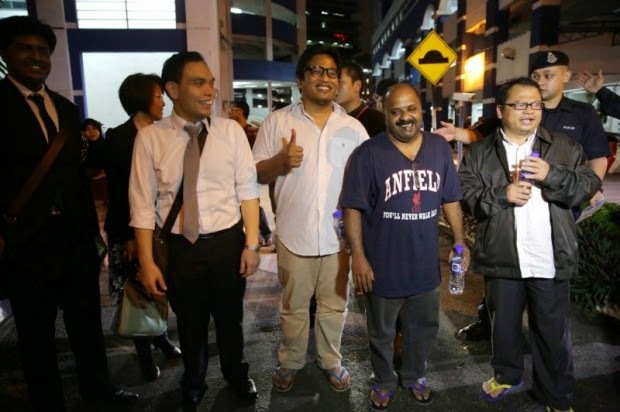 The police this morning arrested Jahabar, the TMI editor, and his boss Ho Kay Tat, and three other editors - Lionel Morais, Amin Shah "Black" Iskandar, and Zulkifli Sulong. Now, I may not agree with TMI's brand of journalism most of the times: they spin instead of just report, but I certainly cannot agree with the arrest of the five journalists over the errorneous article they published (whether or not with the intent to ridicule the Council of Rulers or just because they were too lazy to double check with the party concerned). But having said that, I must ask my fellow journalists and bloggers out there to please stick to the truth at all times when they report a news. Journalists have a duty to report the truth. Not half-truths. Journalists are trained to verify all information they get all the time. It is highly irresponsible for a political portal like TMI, for example, to publish a statement purportedly issued by the Council of Rulers on a contentious issue without checking and confirming its authenticity. My stand on this matter has been consistent and the five TMI editors aren't the frist to be facing a charge under the Sedition Act. Please stick to the truth at all times!!! Regret, some just can't do it Datuk. Pi check ko punya blog archive ler, lato'. Happy to spout the "one chinaman can collapse the ringgit" line, followed by your next, "actually not really likely..." post. Happy to do one pro-hudud post followed (when your paymaster flip-flopped) by a "Nazri's right, you know" post. May help, knowing what you're full of, kan? Did any foreign media also carry this (erroneous) report? If they did, will they be also hauled in for questioning? If their main editorial offices are in other countries, that could be challenging! But I am curious - when Utusan carried the infamous headline about what more do the Chinese want, was that "fair comment", "free speech" or "factual reporting", even if it hurt the feelings of Malaysian Chinese? Afaik, Utusan was not sanctioned for this. In fact, they were praised by certain quarters. So, where do you draw the line or the "out of bounds" markers? Is anything concerning the royalty "off limits" and not to be reported unless it is complimentary or praiseworthy? Where are the checks and balances in the system? Apart from being glamorous, being a journalist carries heavy responsibilities. The publics opinions, perceptions and views on issues are influenced by what they read in newspapers, news portals and blogs. At present the trend among some in the news industry is to create a public opinion based on their political stand or viewpoint. And to do that they seem to go to any length. Twisting, exaggerating and manipulating new and views. Should we as a nation tolerate these irresponsible people or should we come down hard on them to prevent hatred, lies, rumour mongering, chaos and discord in our country? Kebebasan Akhbar or Press Freedom. The true meaning is 'TO REPORT THE TRUTH or HONEST REPORTING. They deserved for spinning and they called themselves TRUE MALAYSIAN. I'd rather read Malaysia Today. I have never believe or trust whatever news that comes from MI or MK. They are famous for publishing lies and deceit that was later retracted or apologized, when damage was already done. Better check their accounts. Check whether there are any foreign hands behind their operation. To me, MI and MK are purveyors of foreign interest, bend on overthrowing the legitimate government that do not kowtow to their master. Look what has become of the middle east where the American had a hand. All these so-called 'terrorist' are initially nurtured, aided and financed by the Americans. 1. Mujahiddeen, Taliban and Bin Laden was initially financed by the American to fight Russian in Afghanistan. 2. To overthrow Syria's Hafez Hassad, the American supplied arms to Sunni rebels which later morphosis into ISIS. 3. The American supported the opposition in Ukraine which enabled them to overthrow the legitimate government, resulting in a civil war. And now we have a warring factions, with American allies supplying arms to those who toppled the legitimate government and Russian aiding those who are angry that their elected government was overthrown through street violence. If you 'push these so called rebels to the wall, they too could morphosis into an ISIS-like groups. Call it avengers, if you like. If they take their war to American's cities, they would then be branded as terrorist. Therefore, it's highly likely that the downing of MH17 was staged to put the blame on Russia. And now they are against the Asian Infrastructure Investment Bank (AIIB), was initiated by China. It's a fact that, everywhere on this earth where there are conflicts, the Americans are involved, whether direct or indirectly and even to some extent, as agitators. You cannot fight against those so-called terrorist without taking into consideration what causes them to thrive. If American don't go around agitating people to overthrow their own government, the world should have been a better place to live today. Your idols Tong can't hide behind his editors forever, you know. "At present the trend among some in the news industry is to create a public opinion based on their political stand or viewpoint. And to do that they seem to go to any length. Twisting, exaggerating and manipulating new and views." That is the ideal of the media industry or what some term as "the fourth estate" but in reality, all media anywhere in the world ultimately serve the interests of their respective owners or paymasters. Sometimes, these owners or paymasters may be liberal about what the editorial team writes up to a point and editorial may get away with promoting ideas which serve their own political or other inclination but if they go too far, the owners or paymasters will rein them in. Do you think that a journalist with for a mass medium owned by say Rupert Murdoch can write anything negative about or against Rupert Murdoch, his companies, his friends' or business associates' companies, or go too far against the political ideology which he believes in? Can a paper like The Sun write anything negative about or against Tan Sri Vincent Tan, his companies, his friends' or business associates' companies, or his politic inclination? Have either The News Straits Times, The Star,The Sun, Utusan or Berita Harian written anything overtly pro-opposition or anti-Barisan? Have Malaysiakini or The Malaysian Insider written anything overtly against George Soros, his Open Society Institute, the National Endowment for Democracy or its subsidiaries? Even in the western liberal democracies, media freedom does not mean the freedom for their journalists to write or broadcast anything they want but for journalists in different media to write or broadcast what their owners or paymasters will allow. Thus you will find publications such as The Guardian in the UK taking a left-liberal stand on matters, whilst a publication such as The Mail takes a right wing position, so journalists tend to gravitate to the media whose stand allows them to write or broadcast according to their political inclinations, and so do their readers or viewers. Like different supermarket and megastore chains, airlines, hotels and so forth, such media sometimes allow different politically inclined editorial policies for business reasons - i.e. as market segmentation whilst others do so in line with the political inclinations of their owners or paymasters. The only difference between western liberal democracies and countries like Malaysia and Singapore is that all these mass media of different political positions or inclinations are allowed to publish in print and broadcast in the liberal democracies, whilst in Malaysia and Singapore, the pro-establishment media can do so, whilst the anti-establishment media are confined to publish online only. So in countries like Malaysia media freedom exists online only, or has existed almost unregulated online in Malaysia until recently. Expression of dissenting views has been much greatly restricted in Singapore all along. For example, why is there no "Singaporekini" where the media organisation is a registered business entity with offices and staff based in Singapore and not overseas? It's a fact that 90% of the Chinese voted against BN in GE13. It's not unreasonable to ask why. If the complaint by the Rulers Coumcil official is to be believed, then TMI published an outright lie about the Sultans rejecting the Hudud amendment. Given the Sultans' role as head of Islam in their respective states and with a majority of Muslims here probably in support of Hudud, I'd say that's a pretty serious lie, and arguably seditious. What more do the chinese wants is factual and real reporting.Truth does hurt unless if you are not kiasu. You've been hiding behind mama's skirt (or was it her wig) for a long time. Journalists spin all the time, and that includes you. If you ask for integrity, look in the mirror first. You cannot deny that you spin for the people who pay you. So you arrest the internet media for sedition but you don't arrest Utusan for sedition. The courts have fined Utusan so many times, your boss gotta keep paying Utusan to enable it to continue spinning. Lu Bukan Journalist...Takde Hak nak comment on journalists!! Penjilat kerja dia jilat saja! By "archive" I mean clicking a couple of pages back, latuk. And by "flip-flop" I mean literally in successive posts. If I'm not mistaken, a super-flexible spine is a business advantage for "ladies of the night" and tired old hacks, no? Let alone tired old hacks who get paid for sleazy services rendered. Rocky , ANON 3.44 was just pointing out some examples of your own standards of "Journalistic integrity" . I'm sure the list is much longer than that. So start with your own paymaster's media before pointing fingers at others that is if you have the balls to do so. 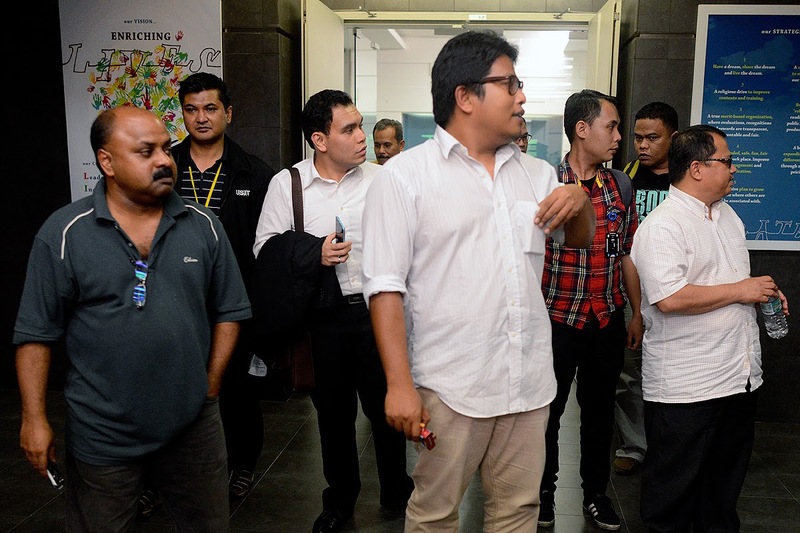 Father is head of Media Prima - Gov's extended hand inside media. Son backs the opposite media. Something's not right with Najib's strategy. For all we know, the father could be leaking valuable info to the opposition. Remember blood is thicker than water. Professionalism is just sugar-coating, nothing more. A man's feeling always hold supreme. Now that Najib's main strategist (actually, a glorified tukang sibuk atur-susun) is out of the way and into the afterworld, hopefully he gets the right advise this time. Better yet, he advise himself what's right and what's wrong. They way things are going, BN gov sudah lost credibility in the media sphere. Now he's dragging the big mothership down. This is not fair to loyal grassroot members who have nothing to do with leadership's wheeling and dealing.